Iamamiwhoami has gotten us used to all these clues and all these symbols throughout the entire campaign, it was almost impossible not to leave some hidden messages in the covers of the BOUNTY singles! But first, some general things concerning the appearance and content of the covers. Hand writing is a means of personal recognition. It functions like a finger print. If the fingerprint can establish the physical appearance of an individual by leading directly to his identity, analyzing the writing of a person could lead to the discovery of that person’s psychic. 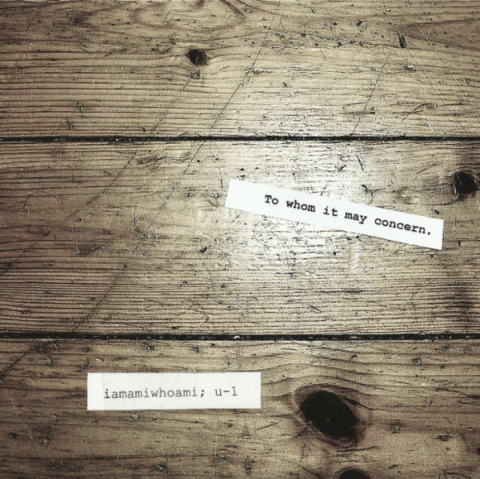 The lines on the iamamiwhoami covers appear to be written with the help of a writing machine. This suggest that the content is meant to be general and impersonal. Neither the sender of the message, nor the recipient are supposed to be pointed out, not even implied. This is sustained strongly by the expression ‘To whom it may concern.”, which is a formal salutation used for opening letters to an unknown recipient. The fact that the writing is not written directly on the covers, but is pre-written on pieces of white (again, as general as possible) paper and then glued on suggests: a) again, like in those crime movies, the sender is totally detached and doesn’t want to be known and b) the content is made for mass distribution, therefore it’s faster to stick ‘etiquettes’ on than to write on so many times. 1. To whom it may concern. The impersonal character of this expression reaches its higher limit. It doesn’t say ‘to whom this may concern’, so the sender detaches himself from the destiny of his message. The formulaic is similar to ‘this communication is intended for anyone that it has importance for’, or ‘to the person that cares or who it’s basically for’. This ‘concern’ is important, because it has the power to render the idea that the recipient cares for the message, a thing that implies a humane feeling. 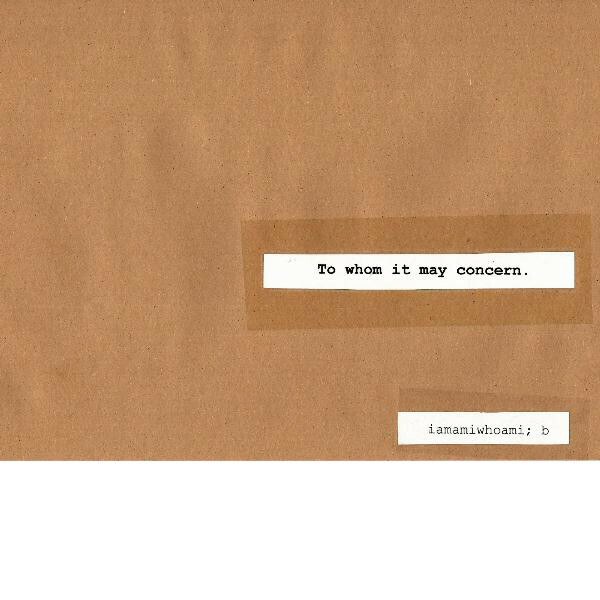 2. iamamiwhoami; b/o/u-1/n/t/y The position in which this line is placed, implies that this concerns the sender of the message and the content. 1. ‘.’ (full stop) – The full stop (dot) indicates a finished thought or sentence. It’s commonly used in statements. A statement is a declarative proposition that has a meaning which is either true or false. The full stop is also known as ‘period’. When we say “You’re not going out, period!” we deny any type of feed back from our listener, we don’t give him a chance to even try to change our mind. 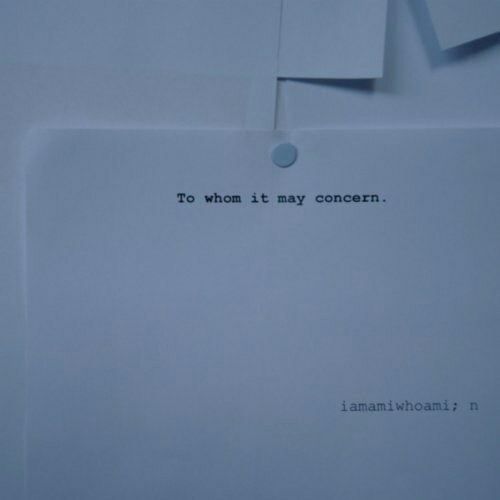 Usually, in letters, ‘to whom it may concern’ is followed by a comma, so iamamiwhoami has placed that full stop over there with a purpose. It’s like they’re saying: if you care, open this package, if you don’t, it doesn’t matter, we still have other 5 (at least) prepared! But you, my friends, could be privileged. Aren’t you curious of what’s inside? Haha! No, I’ve said it before, it’s the way in which they chose to show they are launching a new artistic product on the market. Any product like that is first destined to those who care (like the genre) or who are inquisitive enough to give it a listen. 2. ‘;’ (semicolon) – In elder times, the semicolon mark was used to separate words of opposed meaning, and to indicate interdependent statements, but the modern uses of the semicolon relate either to the listing of items, or to the linking of related clauses. In this case, it relates the sender to the content of the message. 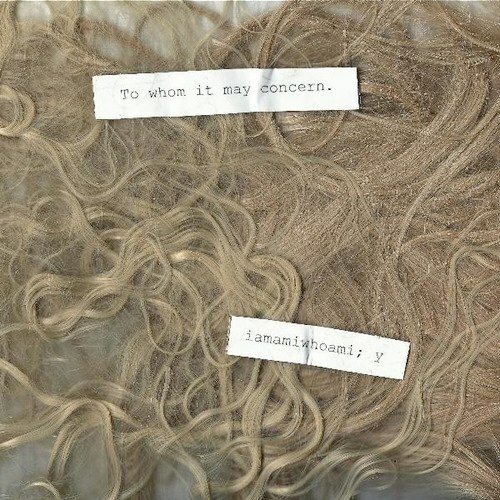 It resembles ‘by iamamiwhoami, concerning b/o/u/n/t/y’, or, if we think of the listing of items: ‘iamamiwhoami’s artistic products; b/o/u/n/t/y’ Thus, we should have known we were in for more since the first cover. 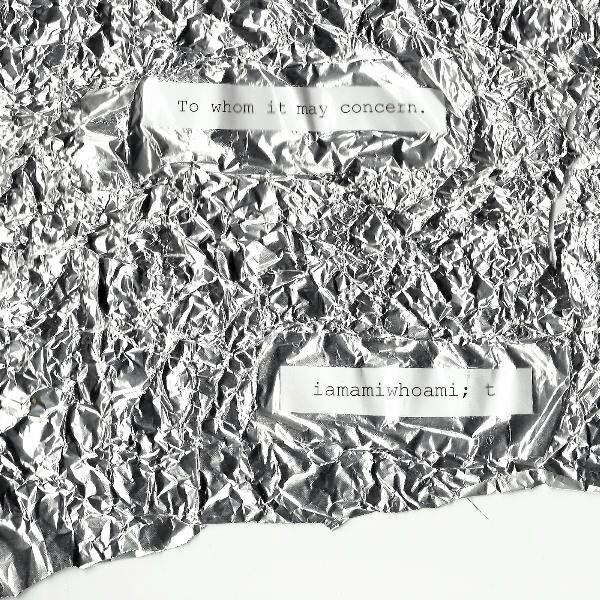 Again, the normal appearance of this line should have been ‘iamamiwhoami: b’ (as in b, by iamamiwhoami, or iamamiwhoami’s b), therefore, the semicolon has a special purpose, probably that of drawing the recipient of the message towards the final result: bounty. And now, to the analyzing of other signs on the covers. The cover for b seems to be a cardboard envelope. An envelope is a packaging means. Metaphorically, it is a content/meaning bearer. The meaning of a cardboard envelope is: an impersonal message that bears a secret and makes the reader vow secrecy. To whom it may concern is, of course, placed where the destination is usually written on an envelope, when one sends a letter. This is a clear message from iamamiwhoami: I have something big/important to say and the way I am doing it is by sending a ‘cardboard envelope’ to important people. That is I have a revolutionary message to transmit to the world and I’m starting by sending my music to the people who (might) like it. Cardboard is often encountered in the iamamiwhoami’s videos. Again, I consider it – in all its forms: envelope, box – a bearer of meaning. We mustn’t forget that cardboard boxes are in fact cubes, which are perfect shapes in space geometry. The cover of O seems to be a piece of wood. 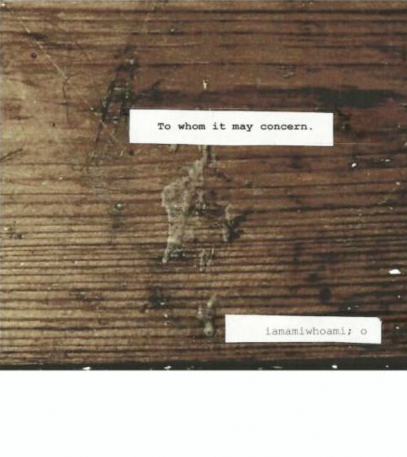 As opposed to the B video, when ‘to whom it may concern’ was glued to an envelope, therefore the message was sent to the reader, with O, the reader is drawn to hear the message at the location. It’s like to whom it may concern is marking a point of evidence: O happened here. Inside the house, of course. If you take a closer look, right under the ‘to whom’ etiquette, you can distinguish a substance, which appears to be liquid, by no means belonging to or coming from the wood, but which rather seems to be spat on. I’m thinking glue. By the looks of it and how it tends to drip, the piece of wood stands vertically, gravitation doing its thing. This is not floor wood. This is the edge of something, probably of a door. The aspect of the wood is faded, it has a darker, more porous texture and it has all sorts of defects, like scratches and stains. This is an old piece of wood. It reminds me of how the house looked in the 6th pre-vid. What’s important is that wood represents one of the most often encountered in the entire campaign. If this is on the upper part of the cadre of a door, like in the beginning of B video, then it means ‘you’re here, this is the location’. I’m not totally confident this is what the cover of O portrays. I may not see things as they actually are. I’m sure there’s more. The wood on the U-1 cover has the power to shine, thus looking a little bit more polished than the O one. This time we’re dealing with a piece of veneer. Probably the one inside the wooden house. The only abnormal things in the pictures are the scratches and the fact that the ‘to whom’ is placed in an awkward position, which makes tilt our heads to the right to read it properly. This could be a signal of the fact that the campaign suddenly goes in a weird direction. I remember the first time I saw u-1 ans u-2, I was shocked. Also, this could be telling the picture should be rotated once towards right in order to get it right. The scratches are a sign of some sort of conflict. I remember the Mandra scratching wood. Probably to get out, to be free. Also, ‘iamamiwhoami; u-1′ is placed a little bit to the left, but I’m thinking is for the sake of the design. Those wooden ‘eyes’ look pretty awesome, especially when you’re looking at the wood in a vertical position. However, the image shows the pieces of wood horizontally, which means they have been placed like that with a specific purpose. I am thinking… there are three of them… they might be referring to the three levels of consciousness: the conscious, subconscious and unconscious. It could make sense, as one is darker than the other (check the dark spots), as one level hides more than the other. if so, the scatches could represent what gets to the surface and the dark spots are the things which are well hidden. We finally have the provenience of the pieces of paper ‘to whom’ and ‘iamamiwhoami’ came from on all other covers. The N cover consists of clean white paper, no cuts, just layered and a pin. I suppose we’re in the house from where everything was sent. Paper is another important element in the iamamiwhoami campaign. At first we were thinking it has to do with wood again (and it does, still) and the process through which wood becomes paper (one of the stages being cardboard). Then we discovered about that knight story and his lady page, and everything started to make a little bit more sense, but the truth is nothing is sure. Flying sheets of paper could imply the unfolding of the course of a story. In N, therefore on its cover, sheets of paper build the walls of a house in the forest and they cover mirrors, to prevent them from reflecting what dwells in the house. The design of the cover is simple, the lines are in place, just like in a formal letter towards an unknown recipient. The only interesting thing is that there are 6 sheets of paper. Count them! They’re 6! Held together by the pin. 6 stories. 6 scripts for 6 complete videos. Remember the kid director in N? Ok, so the cover of T is a piece of aluminum foil, which has been used for wrapping something, after which it has been stretched in order to reveal the content. In this case, the two lines. As if the reader of this message found an aluminum foil ball on the ground and when it opened it, that’s what was inside. Or this piece of used aluminum foil it’s being reused and given another purpose in ‘life’ (that of a messenger) than that of a means of packaging. I remember when I was little I used to unwrap the tin foil the chocolate candies were wrapped in and use it for collage paintings. I could see a little bit of ‘my’ stretching technique under ‘to whom’ and ‘iamami’, lol! I used to stretch it with a coin! One of my favorite covers, because it’s the most ambiguous. I see hair, a lot of it and two types of it: straight and curly. This is quite simple: the straight hair belongs to the wild Mandragora while the curled one stands for the beauty in Y. But metaphorically… that’s another story. If you have read “Wuthering Heights’, you would know how Catherine, the main character, used to describe the loves of her life. Because she loved two men: an educated, rich man and a poor, uneducated (but very shecshey, aha), violent one. That left aside, she used to describe the educated one as a river stone, as in polished and having a smooth surface and shape, and she used to describe the wild one as a cliff rock, as in unpolished and very rough. Can you see what I am hinting at? Ok, now, the fact that these pieces of hair are laying on the ground is very important. Because it’s a sign that the campaign is over and we’re heading for a reveal. It’s like Jonna left her wigs aside, the wigs being part of her cover. It’s like Mandra has completed her cycle and is now just a mask. Llamas have two types of fiber-guard hair and undercoat hair. The guard hair usually grows faster, is hollow, courser and straighter than the undercoat. These guard hair tends to effect snow and rain and help to run off water, debris tends not stick to the guard hair. The undercoat usually is finer, with much more crimp than the guard hair. These two factors create more loft which keep the llama warmer in winter by trapping in the body heat and in the summer allows the wind to cool the body better. I guess we’ll see in the next video. Helpful blog, bookmarked the website with hopes to read more! This article especially is quite revealing. I couldn’t have thought of sooooo many things when looking at those covers.